Alistair Overeem defeated Aleksei Oleinik via first-round TKO to close out UFC Fight Night on Saturday in St. Petersburg, Russia, but there were surprises elsewhere on the main card. 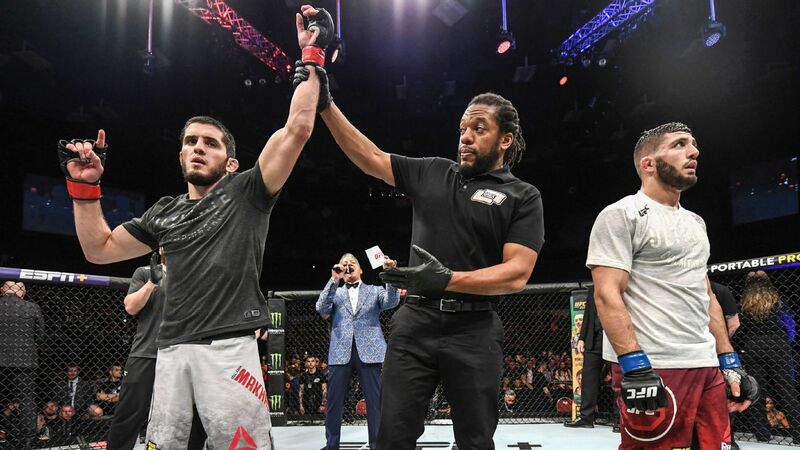 Islam Makhachev holds off Arman Tsarukyan to win by unanimous decision. For more UFC action, sign up for ESPN+ at https://plus.espn.com/ufc. Shamil Abdurakhimov wears down Marcin Tybura and wins via TKO in the second round. For more UFC action, sign up for ESPN+ at https://plus.espn.com/ufc. Krzysztof Jotko uses takedowns and punches to beat Alen Amedovski by unanimous decision. For more UFC action, sign up for ESPN+ at https://plus.espn.com/ufc. Movsar Evloev gets the best of Seungwoo Choi and wins via unanimous decision. For more UFC action, sign up for ESPN+ at https://plus.espn.com/ufc. Sultan Aliev and Keita Nakamura battle for all three rounds, but Aliev wins by unanimous decision. For more UFC action, sign up for ESPN+ at https://plus.espn.com/ufc. What's next after UFC 236? Marlon Moraes took over the top spot at 135 pounds going into his June 8 UFC title with Henry Cejudo. Louis Taylor took home $1 million last year after winning the PFL's middleweight title. He plans on doing the same this season at welterweight. Kayla Harrison sees one big difference between herself and fellow Olympic judoka-turned-MMA fighter Ronda Rousey: 'She never wanted to fight Cyborg. ... I can't wait to fight Cyborg." The Professional Fighters League on Thursday revealed more than two dozen additional participants for its 2019 season. Check out MMA writer Brett Okamoto's rankings within each division. All the UFC champions in each weight division, male and female.